Life Still Blooms: A Celebration of "Bagdad Cafe"
Sometimes it takes an outsider to see a whole clearly. And there have been few more funny and empathetic portraits of American small towns and American loneliness than German director Percy Adlon’s 1987 film, “Bagdad Cafe.” Set at a roadside truck stop in the sweltering Mojave desert, “Bagdad Cafe” is a wondrous film that feels needed very much in this cultural moment. Its sensitive eye for its diverse cast of misfits, travelers, and runaways goes against every suspicious xenophobic impulse currently choking the body politic. The rural life rhythms of the people that make their home in the motel behind the little rusted out gas station, and cafe where much of the film’s action takes place, are radically different than the caricatures presented to us in disconnected newspaper profiles and by barking cable pundits. The story begins when Jasmin (Marianne Sägebrecht), a German tourist abandoned by her husband on a road trip through the Southwest wanders into the little station. The place’s owner Brenda (CCH Pounder) is immediately mistrustful of the new arrival but rents her a room. She has troubles of her own, having fallen out with her husband. And her children seem more interested in playing Bach on the piano or running off to town, respectively. The tourist catches the eye of Rudi (Jack Palance), a former Hollywood set painter. He becomes instantly enamored. And in her motel room, Jasmin unpacks a child’s magic trick set and begins to teach herself how to make things disappear. “Bagdad Cafe” is a seemingly small film that on reflection reveals the depths of its emotional currents. The film is about shimmering desert colors, and little buildings lost in the endless expanse of sand and scrub brush. It’s about seeing tricks of light in the sky and them leading you to an unexpected home. And now, crucially, it’s a film about small town America that recognizes real America is diverse. African Americans, Indigenous peoples, Hispanics, immigrants all trying to make the perfect cup of coffee and traveling life’s road from heartbreak to connection. The cast is a wonderful ensemble of interlocking glances, furtive smiles, and gestures of welcome. Jasmin unwraps layers of her Teutonic frigidity carefully. She accidentally took her husband’s suitcase with her when they quarreled and parted. And so her outfits are an increasingly improvised set of shirts, trousers, and underwear with scissors taken to them. Pounder is great as Brenda, her outward gruffness not hiding very well the pain life has dealt her. And in the end she is unafraid to reach for a change of old habits. Palance is marvelous, particularly if your only impression of him has been through his many villainous turns. He’s warm, tender and utterly delighted by being in love again. In a cultural moment where every facet is hyper-polarized and we seem capable of only communicating with each other by screaming, there is something blissfully oasis-like with films such as “Bagdad Cafe.” The film’s humanity and curiosity about people lingers. It makes you look closer at the people around you. Its acknowledgment of our flaws and its willingness to embrace us in spite of them is a sorely needed respite right now. The idea that we might not need to be perfect, that we can be prickly and lose our tempers and still be worthy of love and a family is beautiful resistance to the idea life is a pass/fail test. It’s a observation so banal it’s found its way to mugs and tote bags, but life is a journey. We leave old selves and lives behind, find new ones, and then leave those behind either for the next stop or the last one of our inevitable death. But we can be remembered while we’re here, and live on in the stories other people tell about us. 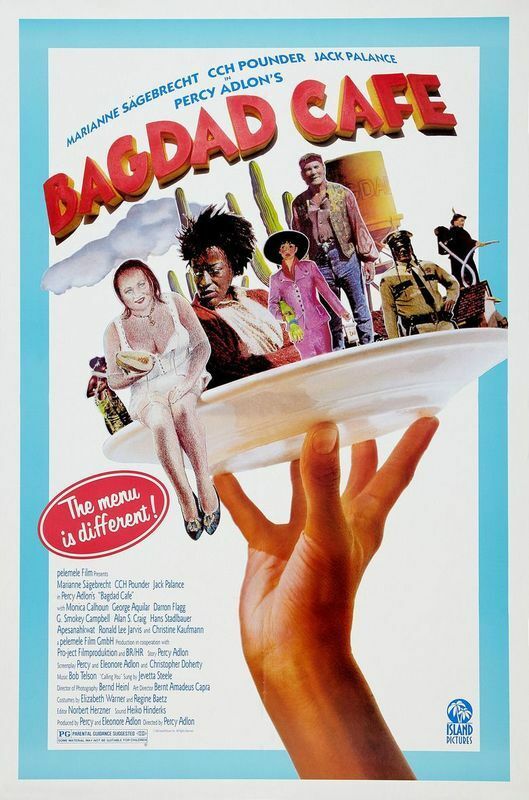 “Bagdad Cafe” is a movie that touches on all of those things. It’s a road map for how to do more than survive this world but thrive in it. And that even in the most inhospitable desert, life still blooms.